io9 March Madness: What's the Best Sci-Fi/Fantasy Film of the Past Decade? 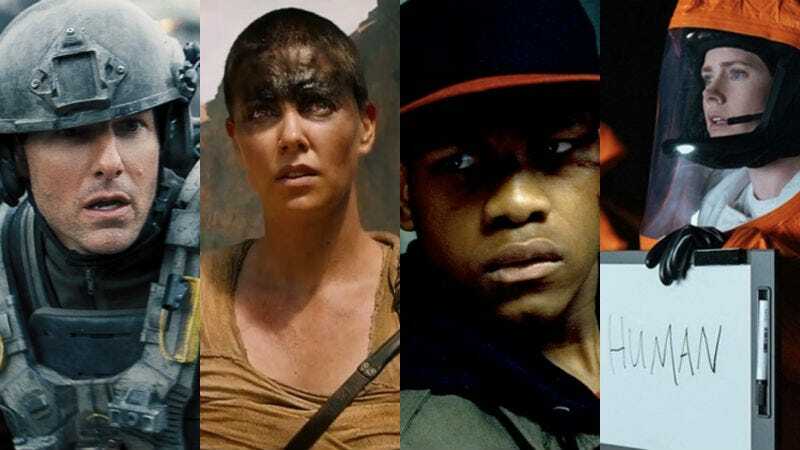 Our #1 seeds: Edge of Tomorrow, Mad Max: Fury Road, Attack the Block, and Arrival. io9 has a long history of March Madness but it’s been away for a while. Now it’s back and we’ve got a bracket that’s destined to really and truly make everyone absolutely crazy. We’ve gone ahead and picked what we believe to be (and, right there, there’s already room for debate) the 64 best sci-fi films of the past decade. We took them, ranked them, and then seeded them, with the top four (in our opinion) all ranking number one, the next four, all ranked number two, and on and on. The results yield some very challenging matchups between some of the best movies of the decade—all leading to a final four and championship that’s near guaranteed to have you tearing your hair out, just as the best brackets tend to do. Here’s the bracket as an image file. Click to enlarge, download and print. So have a blast, and don’t get too angry if your favorite movie is missing or has an unfavorable match-up? Sorry. That’s life in brackets. If you want to see some other people’s brackets, here you go. Though I was literally the person who ranked the films, I was surprised when I actually did it to find only one top seed got to my elite eight (Attack the Block) and in my final four, the highest seed was a #2 (Into the Spider-Verse). Leading to that point, I think the hardest decisions were all centered around the 2009 Star Trek. That versus Edge of Tomorrow and Guardians of the Galaxy were very tough but, in the end, Guardians is my favorite Marvel movie and that showed. Obviously, my final four matchups were both tough, but I had to move Cloud Atlas up against Spider-Verse in the final seeing as each was my favorite movies of their respective years. A personal #1 versus a personal #1, two movies that kind of blow your mind in so many ways but, ultimately...I went with Cloud Atlas for the upset. I just felt like once you made those hard, early decisions, you kind of knew how it was going to turn out, and things progressed from there. Pardon my handwriting, but my final four were: Black Panther, Wonder Woman, Get Out, and Spider-Man: Into the Spider-Verse. Any of those winning is fine by me. BUT let’s say for the sake of saying, Black Panther vs. Spidey in the finals, then Black Panther wins after a few OTs. I thought Rogue One should be higher than a 16 seed, though Fury Road is obviously gonna knock almost anything out though. The Witch vs. What We Do in the Shadows killed me—two of my favorite recent horror movies (even though one is a comedy), and I just couldn’t pick one. But I knew Spider-Man was going to defeat whoever in the sweet 16 round anyway. Being the ever-decisive person that I am, this was actually pretty easy until I got down to my final four: Black Panther, It Follows, Get Out, and Into the Spider-Verse. At that point, I had to begin weighing how much I personally enjoyed the films on a visceral level versus how much of a substantive, meaningful discourse has developed around each of them, which is difficult, because they’re all different and have their own strengths. Ultimately, though, as much as I love cape movies, it’s not as if studios are ever going to stop making them, whereas smaller projects like It Follows and Get Out are rare gems of cinema that both felt like fresh breaths of air. From there, though, the choice was simple: Get Out. But anyway, after a lot of deliberation—and having to sacrifice some objective appreciation of films to set up the absolutely personal truth that I love Captain America: The First Avenger a lot more than I ever could The Winter Soldier—my final four were Star Wars: The Last Jedi, Ex Machina, Get Out, and Spider-Man: Into the Spider-Verse. And this is where you see begin to see a tough divide that makes March Madness, well, Madness: having to weigh technical, objective filmmaking prowess, and the impact that each of these films had on me from a critical perspective, with the personal emotional context of what each of these movies meant to me specifically as an individual. It was almost impossible to reconcile the two, so maybe I went with the easy option and followed the heart over the head. That set up a final clash between two films about characters that I have adored since I was a toddler—two films that both dearly love their source material while being deeply, boldly unafraid of pushing them beyond the familiar and onto new and invigorating paths. Films that invited the hopeful reminder that while the past holds many lessons, future generations should never beholden to its grip forever. Both invigorated everything I love about the worlds these characters inhabit after wayward years of growing cynicism—but in the end, I had to give it to the kid from Brooklyn, and his technicolor ride through the Spider-Verse. I hate the very idea of this, for the record. My hardest call was Mad Max: Fury Road vs. Star Wars: The Force Awakens as both films hit me on a deeply personal level. I will also say I had a pretty tough time with Cabin in the Woods and Captain America: The First Avenger as both are excellent examples of their respective genre. Captain America’s earnestness pushed it over the edge for me but it couldn’t compare to the sheer joy that was Thor: Ragnarok. In the end though, Fury Road’s “we are not things” message and extraordinary action won the day. io9 March Madness Championship Round: Star Wars vs. Star Trek! io9 March Madness Final 4: Trek vs. Doctor Who, Marvel vs. Star Wars! io9 March Madness Elite 8: Lord of the Rings vs. Star Wars! io9 March Madness Sweet 16: Game of Thrones vs. Firefly! io9 March Madness Round 2: Harry Potter Vs. Star Wars! Hobbit Vs. Alien! io9&apos;s March Madness: Star Wars Vs. Dune! Firefly Vs. Xena!